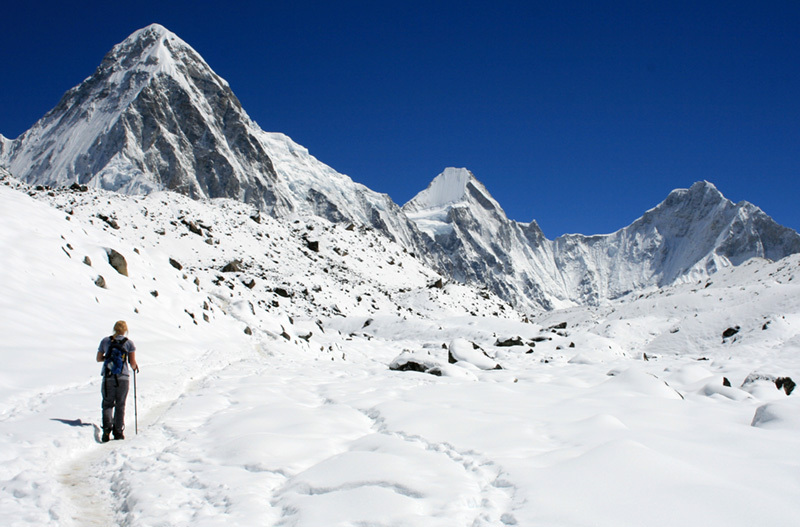 Kathmandu trekking – the easy and comfortable trek which introduces pristine wilderness area and open up the rich opportunities for cultural tourism, ease of access, convenient location make it one of the budget treks for those with limited time. Kathmandu trekking is a moderate, no fuss trek that displays the best of Nepal’s rural culture and stunning mountain views that can be enjoyed with simple preparation and minimal equipment. This trail nearby Kathmandu is enriched with combination of rich culture, tradition and art. The way of life of various ethnic people is another feature to experience in this region. From Kathmandu, it’s a short half an hour drive through the city, past a hugh Boudhanath Stupa and out into the countryside. Sundarijal is a small market square located at the entrance to Shivapuri national park. At Sindarijal, there is a large water project that supplies much of Kathmandu’s drinking water via an immense pipe. The trial from Sundarijal goes up through forests to a medieval-looking reservoir, dam & waterworks. The first village on the trial is the sprawling Tamang settlement of Mulkharka at 1800m where you can have refreshment and enjoy a spectacular panoramic view of the Kathmandu valley. From here, you have a long haul up the stair case, through farming villages, terraced fields and open grazing fields. While you reach at the top of the stairs, the trial steadies and passes through jungle on route to Chisopani. Once you reach at Chisopani, a cool and clear weather will greet you with tantalizing view of the Himalaya. Overnight rest at tea house. 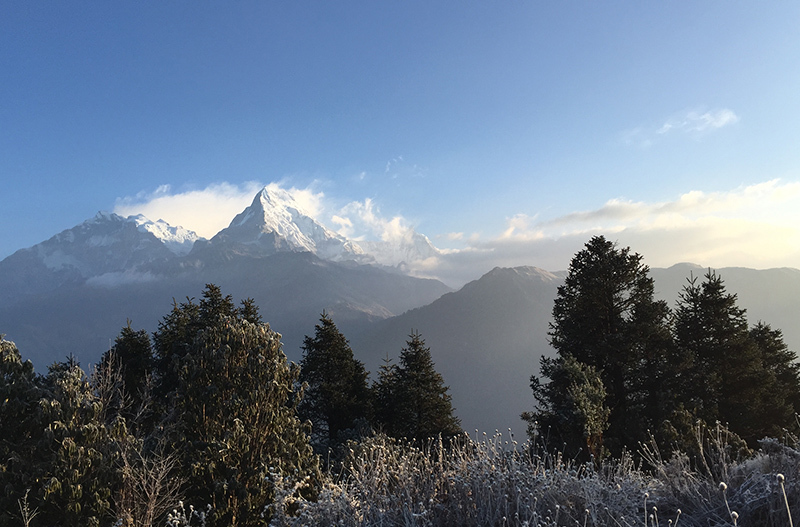 The trek goes through the lush forests and Dhaps ( wet lands) and out into the rural hillside farming land, given clear weather with stunning views through most of the day featuring Gauri Shankar, Shisapangma, and Mardi himal. On the way nearby army camp, you can have some tea shops where you can have rest for refreshments and lunch. After lunch, the trial proceed downhill on a narrow passes through several farm yards before joining a simple road through the terraced fields and then into largish village of Chauni Bhanjyang and through pine forest and villages you can reach at Nagarkot. Overnight rest. After sunrise tour and breakfast, starting down from Club Himalaya, you have a small walking trial which cuts across the hillside and takes you towards Rhonnie Bhangyang. The views of Panchkhal valley to your left are very good and given clear weather you should again get memorable views of the mid himalaya, included Everest. Further, you will pass fertile land with paddy field, villages and forest with magnificient views of valley and mountains. 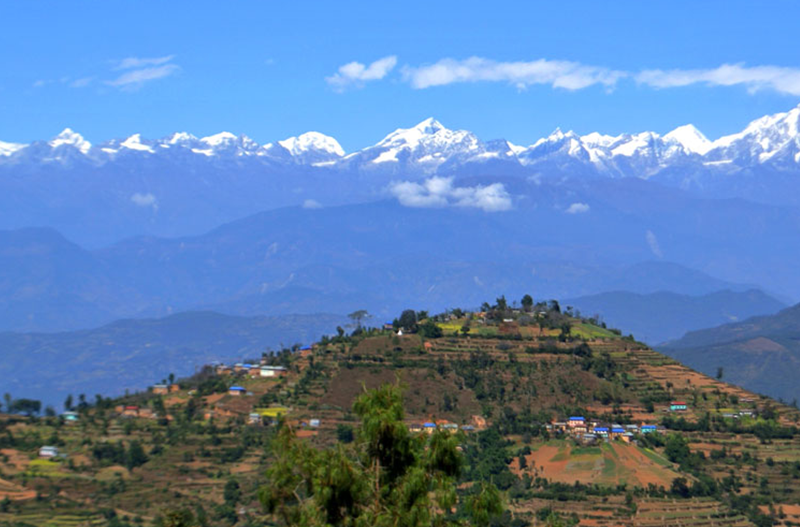 After 5-6 hours walking you will be at the Dhulikhel, a Newari town from where you can explore stunning views of the northern mountains and typical Newari tradition and cultures. Overnight at hotel. After breakfast at Dhulikhel, we walk three hours to Namo Buddha on the hill above Panauti. A beautiful monastry lies on this hill and offers spectacular views of fertile land and villages. 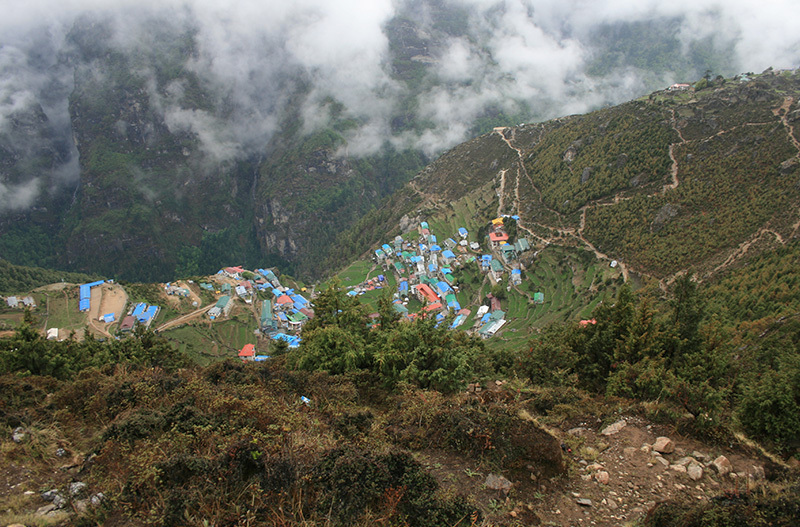 Later, we walk another three hours to Balthali Village which offers superb views at an altitude of 1730m. The resorts stand at an outstanding place of isolation and relaxation amidst a surround of typical Nepali countryside with paddy fields and ochre thatched farm houses. On the northern horizon, the snowy peaks of Dorjee Lakpa, Langtang and whole range of mountains can be explored in a clear day. Overnight at Balthali village resort. After breakfast, we head down to Panauti, a Newari town which is wedged between the confluence of Punyamata and Roshi Rivers. It forms the shape of a triangle with a serpent idol at each standing at each of its three corners to protect from floods. The town even lies on the foundation of a single stone, it is why local believes that earthquake never make any damage for the houses resident in this area. It is an ancient and tiny town, where you can view all old temples, culture, festivals and green forest. The town also boasts one of the only known pre-17th century structure of Mahadev Temple. Apart from many other temples it is a pleasure to wonder the town’s stone paved streets; magnificently carved traditional houses and stone water tapes. Afternoon drive to Kathmandu 40km from this town.